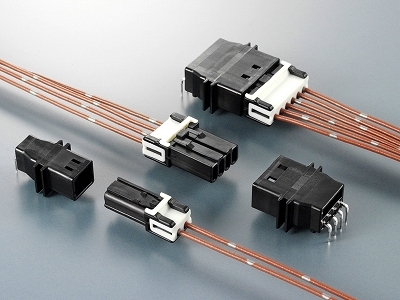 MX44 Series | Japan Aviation Electronics Industry, Ltd.
JAE has developed the MX44 series compact waterproof connector for automotive applications. It has been made more compact by adopting a structure that closely presses the rubber seals to mating surfaces. Due to the vibration absorption function of the rubber the connector has an improved vibration resistance. Moreover, each contact is individually waterproof, making the connector suitable for use in harsh environments such as engine areas. Connector size reduced by waterproof structure with tight sealing rubber in the mating area. Vibration resistance improved by rubber absorbing unsteadiness of connector and contact. Adopts single contact waterproof structure which makes each contact separately waterproof. Socket contact is a box type which is strong against external force, and contact area adopts proven double spring which is resistant to twisting. Contacts set in position by inserting retainer from wire side. Retainer protects connector lock portion. AVSS 0.3 to 0.5 sq. The values specified in this web site are only for reference. The products and their specifications are subject to change without notice. Contact our sales staff for further information before considering or ordering any of our products. Please contact us if you are considering use involving a quality assurance program that you specify or that is peculiar to the industry. Also contact us regarding the details of use, usage, specification before considering or ordering any of our products.